Saint Peter's Church, a place of worship built in 1926 by Italian immigrants in Duluth's "little Italy" neighborhood, sits on the Duluth hillside overlooking Lake Superior. Having closed in 2010, the future of the building was uncertain in 2013 and with an estimated cost of repairs around 3 million dollars, saving the building seemed unlikely. However, in 2015 when all hope for the building seemed to be lost, Jeff and Brock Larson purchased the church to open Great Lakes Academy of Fine Art (GLAFA), a school following the Atelier (French for "the Studio) model, an educational style that traces back over 500 years. The father and son duo spent the next year and a half renovating the church and, in Fall 2016, welcomed their first group of students to GLAFA. 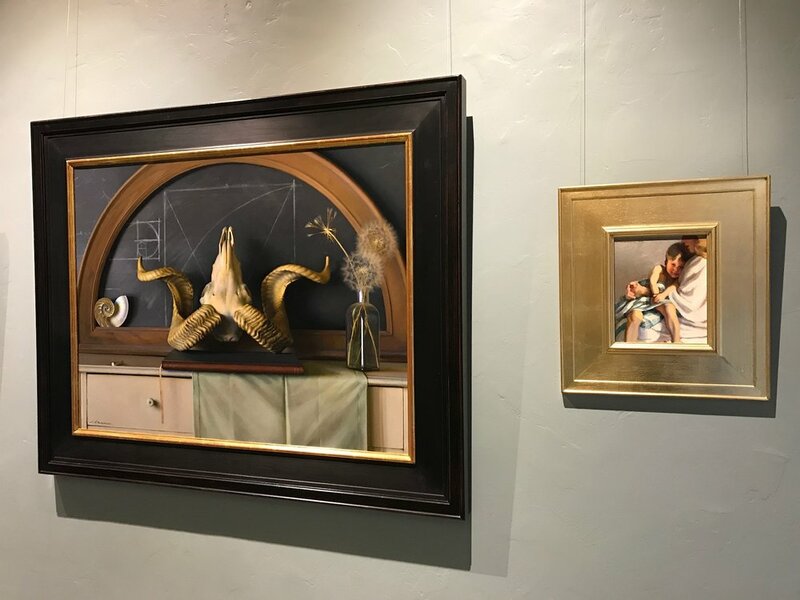 This past Memorial Day weekend, Up North Lit caught up with the Larsons at their first annual Student/Instructor Exhibit to discuss the academy, their journey as artists, as well as any advice they might have for students just beginning their artistic pursuits. UNL: Could you both give a little background on your journey/life as artists. What led you down this path? BL: I grew up fortunate to watch my dad paint for as long as I can remember...drawing with him as well as my grandfather (Marvin Espe) fueled my passion for visual art and the determination to hone my skills. After high school, I moved to Minneapolis to pursue formal training at The Atelier Program of Fine Art. The Atelier system is a very time tested, traditional method of teaching that dates back to the French Academies of the 1500s. These classical methods give the aspiring student the tools to see nature, to translate it from three dimensions to two dimensions, and to execute it with skill. I understood that I needed to learn the “language” of the visual world before I could translate it and articulate what I wanted to say as an artist. I studied for five years full time and taught for two in Minneapolis before moving back to my native twin ports last June, 2016. JL: I was blessed to stumble into meeting Richard Lack while I was a senior in high school. He ran Atelier Lack, one of less than a dozen studio schools in the world that still continued to teach the craft and artistry of oil painting. This tradition, handed down from master to student for five hundred years of western civilization was almost lost due to the modernist philosophies that came into vogue at the turn of the twentieth century. I was one of five students accepted in 1980 into the full-time four-year apprenticeship. Upon graduating four years later I helped open a branch school where I met my wife Heidi. After two years of teaching I decided that I wanted to focus on my own art and have painted full-time professionally ever since. UNL: What led to the creation of the Great Lakes Academy of Fine Art? How long had you been thinking about establishing this school beforehand? BL: During my time of study in Minneapolis, my dad would come down to teach at the Atelier once a month. He rediscovered his love for teaching and recognized the important role that verbally instructing a student has on an artist's own work. We have been playing around with this idea for the past few years or so, looking at strengths and weaknesses between all of the Atelier schools around the world, trying to come up with what we imagined as the best, most rounded program that we wished we could have studied under ourselves. The idea came into fruition a year and a half ago with the discovery of the old St. Peters Church being available for sale, giving us the ideal studio space we were looking for. After a year and a half of intense renovation on the building, as well as instructing our first year of students, here we are! JL: When it became apparent that Brock was destined to also become an artist and decided to attend the Atelier now run by two of my fellow students ( Mr. Lack passed away six years ago), I once again began teaching at the Atelier once a month in order to be involved in his education. As he progressed, Brock began teaching also and the idea began to gestate that maybe one day we would open our own school. We are both so grateful for having had the training that we received and feel it is our obligation to pass it on. UNL: How many students does Great Lakes Academy of Fine Art admit each year? What is the application process like? What do you look for in potential students’ work? BL: Typically an Atelier, (which is the French term for “the Studio”), is meant to be kept very small, so our total number of students at full capacity will max out at 20 full-time student positions. Since it is a four-year program, we only intend to accept four to five at the beginning of every year. The application process includes the potential student presenting a portfolio of past work and an interview with my dad and I. We are mostly interested in accepting students who show the drive and determination to learn and continually improve their skills. The training is very intensive and we are looking for students with perseverance and patience. JL: The four-year program can accommodate only 20 or so students, so we hope to accept five or so students a year. Applicants send us a portfolio of their work along with filling out the application/questionnaire. If this looks good, we invite them for an interview. We are looking as much for drive, desire, and determination as much as solid work. “Talent” is common I have decided. Having the ability to work hard, persevere not so much. Paintings by Jeff and Brock Larson featured at Great Lakes Academy of Fine Art's First Annual Open House. UNL: As artists, what does the Twin Ports and Northland mean to you? Has it affected the style or content of what you create? BL: Growing up in the Twin Ports, moving away for six years, and coming back has given me a new appreciation for the natural beauty of this area. I have rediscovered my love for the outdoors and have been very inspired to paint landscapes of the wide variety of landscapes the Northland offers. I think the ability to escape the city within 15 minutes will be very beneficial for our students that study at GLAFA. JL: As much as one's environment affects anyone one on multiple levels. We love this area and it is our home, I have traveled much and there's no other place I would rather live. The great lake, the beauty of the Northland countryside, the outdoors lifestyle all play a part in who we are and what subjects we are drawn to. UNL: Do you find inspiration in any other forms of art? Do you have any other artistic pursuits? If so, how does this artistic overlap influence your work? BL: I would have to say music is probably the most inspirational art form to me outside of painting/drawing. I’ve been playing instruments since I was 11 and find many similarities between the two arts. The creation of a song, same as a painting, requires several different mental tools and mindsets to approach each stage of the project. It’s a balancing act between right brain and left brain, the vision/emotion, and then the technical skills/understanding always switching back and forth to cross-check each other until completion. JL: Not so much. I enjoy them as many do but don’t pursue them. Life is short so I am pretty focused on just trying to be the best visual artist that I can be. UNL: Where do you look to for inspiration? BL: Typically, I find most of my inspiration looking to the painters of the past including John Singer Sargent, Isaac Levitan, and Willard Metcalf just to name a few. I’m always inspired that we are using the same tools and techniques they used and that they figured out how to make their paintings relative throughout the decades and centuries. The old masters as well as the beauty of our natural world are my biggest inspirations. JL: It comes from everywhere and anywhere. A river bend, a casual pose someone strikes, a unique object seen in an antique store, a turnip at Cub Foods, a passage in a book…. Beauty is all around us, we just have to open our eyes and free our mind. UNL: What advice would you give to an aspiring artist, whether that be a painter, writer, or someone following some other artistic pursuit? BL: The only way to fail is to quit. Expect it to be difficult and try to enjoy the roadblocks as a challenge that you can learn from and come out the other side more equipped. Don’t give up! JL: Think long and hard if it is something that you enjoy or something you need to do. If it is the former, practice and enjoy it. If it is the latter, find the best instruction possible, arrange your life so as to maximize your ability to study and practice and never, ever, give up. UNL: Where can someone go to find out more about each of your work or Great Lakes Academy of Fine Art? Will you have any upcoming events this summer? BL: greatlakesacademyoffineart.com has most of the schools information and updates. My personal website is brocklarsonstudio.com, (and is in major need of update), so my current work is mostly on Facebook and Instagram: @brocklarsonstudio. We are planning to host week long workshops throughout the summer, check the website for specific dates and details. JL: Check out www.greatlakesacademyoffineart.com and www.jeffreytlarson.com. Also follow me on Facebook: @Jeffrey T. Larson Studio Page; on Instagram: jeffreytlarson. UNL: Anything else you wish to share with us? JL: There are only a couple dozen schools such as ours teaching at this caliber in the world. It is our goal to be among the best. People ask us “why Duluth?” We say, “why not Duluth? We will also be offering this training to anyone interested in our part-time evening classes, which we plan to begin this fall. We will teach the same fundamental curriculum as we teach to the full-time students. We will also be presenting workshops along with hosting workshops and seminars from some of the leading contemporary artists in the world. All this information will be on our website as it occurs. You can also register so that we can notify you to these opportunities.